Unreal Lawns supply and install artificial grass in Altrincham and the north west of England. We serve domestic and commercial customers in the area, with products suitable for a wide range of applications from outdoor spaces and gardens, to event areas, exhibition space and more. See below for some examples of projects we've carried out in the Altrincham area. It’s very daunting to even contemplate maintaining the standard of lawn needed for home golf practice. 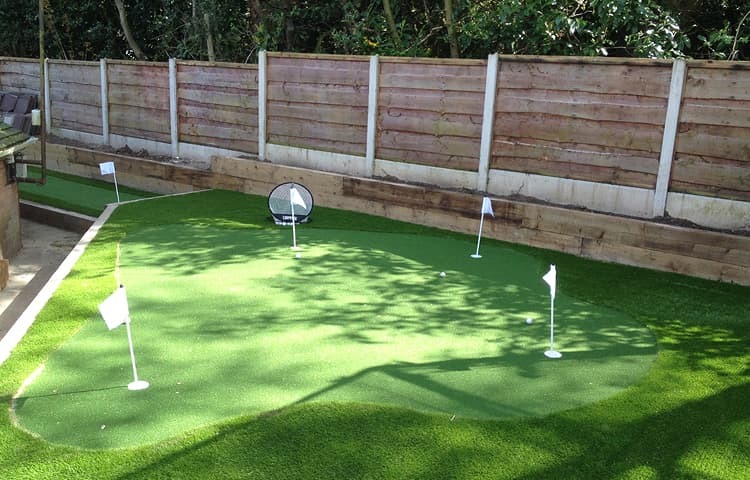 By choosing artificial grass you can experience the feeling of being a golfing pro with your very own putting green at your home. Unreal Lawns can install a top quality putting surface in your garden which allows for a superb roll and ball speed. Our artificial grass golf surfaces are easy to maintain with no cutting, feeding or weeding needed, providing a putting surface you can use all year round. You don’t need to have a large space for us to work with; our team can work with you to design a surface that you will be proud of, just like a gentleman in Altrincham, Manchester has. He approached us to see what we could do with an area of unused wasteland that sat behind his garage. After our initial conversation and visit to the property we could see that he was a huge golfing fan so suggested the idea of making the outdoor area into a small putting green. The smile on his face said it all, he was over the moon with the idea of being able to touch up on his golf skills without having to leave his home. As you can see from the picture the finished project looked fantastic. We were called in to transform this garden ready for the Easter Bank Holiday Weekend. 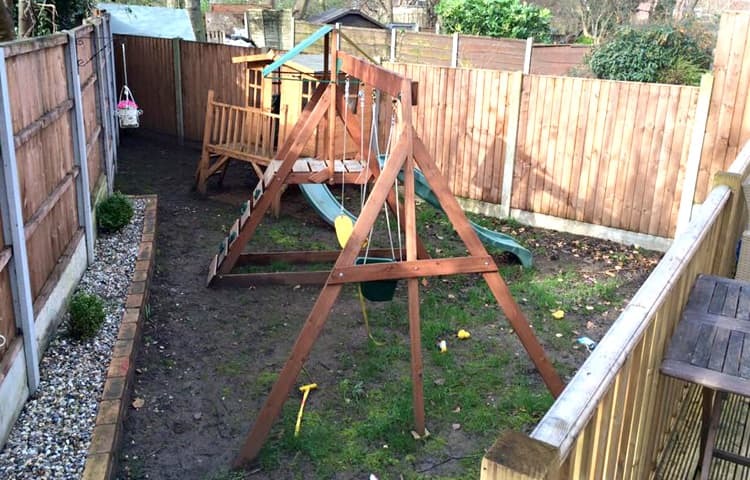 The weather was fantastic and the family were able to enjoy their newly developed garden. The product used for this project was our supreme artificial grass. 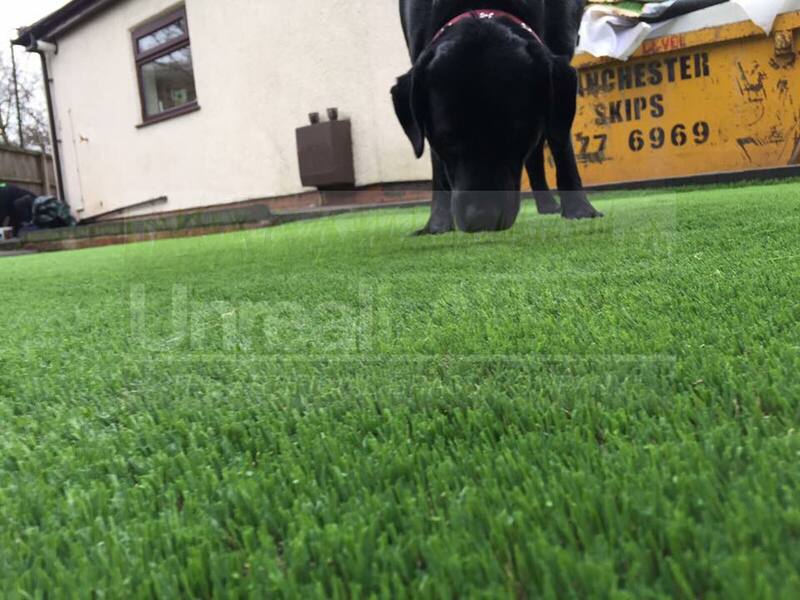 Unreal Lawns were contacted by a customer in Timperley, Altrincham who wanted to turn their boggy lawn into a usable and pleasant space again. We installed our Luxury 35mm artificial grass, providing a neat and green lawn area that can be used all year round by the dog without coming back inside with muddy paws. As you can see from the photo, the dog loved the new artificial law, and his owners were even more pleased.